Game review: The Cycle Of Life Continues. Hello there everyone. It�s great to finally back (and a lot more active, though it doesn�t seem that obvious) here on sploder. :) After a short while of browsing my old reviews and cringing, I�ve decided to make another (hopefully with much more quality, but you guys be the judge of that) review in a vain attempt to hide my old, cringeworthy ones. 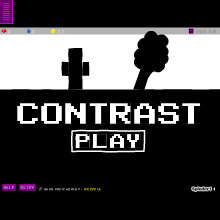 :�) But anyway if you�ve seen the thread on the forums that I made a few weeks ago, I�ve selected two games to review and this game� entitled Contrast, created by opengangs� is (obviously) one of them. From what I can gather from the description of the game, Contrast was an entry for the EGD and it was also featured a while back. While those facts do heighten my expectations for this game by a fraction, its preview does not make me feel too inclined to play the game. The game�s thumbnail seemed like every other PPG that was designed in the same monochromatic palette. It somehow felt pretentious in a way, as most creators use the simplicity of the palette and style in order to make things appear deeper than they should, even though there may be no meaning behind it at all. To me, it�s akin to a china doll, all aesthetic but no function whatsoever. But with that being said however, I hope Contrast, by the end of this review, proves itself to be unique compared to the multiple sploder games that are created in this particular style. Like any other good player, I had taken the time to read the story before proceeding to play the game. While the concise story had started out quite rough and definitely made me feel a bit iffy on the game, I think that opengangs was able to redeem himself by the end of it. Some particular lines that had caught my (positive) attention were: �When we lose someone or something that is precious to us, we may realize that there is a certain aloneness that can never be filled. Ultimately the condition of life is one of being alone before God.� Those lines were quite laudable on their own and were definitely able to change my earlier expectations for Contrast, as I could see how well the creator was able to put together a good concept to go with the style of the game. As I played through Contrast, I was able to see how well the titles of the levels and the storyline had come together to show the player that you were going on a journey through the various stages of life. It�s definitely an interesting concept, though I wouldn�t say that the game was completely original since the rest of the game plays like a regular platformer. Although, I definitely give props to opengangs for coming up with a concept that was different to the typical �You have amnesia and..� or �You have to save the world�� type of game. As for the general design of Contrast, I wouldn�t say that it was jaw-dropping, but it was definitely detailed as you went through the levels. It was impressive how opengangs had put so much attention to detail on the objects and what they represented in the game. Even the ambiance of each level with the music (and even the lack of music in one of the levels) that the creator had chosen went very well with Contrast�s design. From the foregrounds to the different little details, shades and shapes in the background, you could tell that opengangs definitely put a lot of effort into making the game look nice despite the fact that his style was limited to shades of grey. While I do commend the design as it is much more impressive than all of those other black and white games, this design was also the reason why the placement of various switches and platforms were quite flawed. The monochromatic color scheme did not allow the player to be able to distinguish which objects were switches, which ones were moveable, which ones were there purely for aesthetic and whatnot. This made Contrast more of a guessing game more so than a platformer. I call the game a platformer as I barely stumbled upon any sort of puzzle, unless you count the �guessing which platforms could move or be moved besides the really obvious ones� as a puzzle. The creator should have considered making some sort of an orientation or tutorial level so that players would at least have an idea on what to do and where to go, because starting the game was very difficult and disorienting to me since the switches were practically invisible and the map was quite zoomed in, so you really wouldn�t know that you had already activated a switch that triggered something from the other side of the map. In addition, the win condition/goal placement was also flawed as there were situations� such as in level one� where I could somehow find a way to glitch out or pass through some of the platforms and get out of the map to instantly win. Perhaps opengangs could have changed the win condition to getting a coin of some sort in order to win instead of having to go out of the map to get to the next level, as it presents quite a bit of a problem when players can simply glitch out of the map to win. Now that you�ve heard some of my gripes on the game, you can probably deduce that my experience while playing Contrast was not the most enjoyable. The glitches, the hard-to-distinguish switches that activated things I couldn�t see from my view, and some other things I had mentioned are testaments to that. Although opengangs had informed me that he had a walkthrough video, I (surprisingly) didn�t need it so much after a few levels into the game since Contrast had a pattern of either hiding switches in the very far ends of the map, or pushing something in order to use it as a platform to pass through to get to the goal. Once I discovered that, I practically breezed through the game. Although, I�d honestly say using the word breezed isn�t so appropriate since the controls of Contrast were quite frustrating and clunky as well, which made me take a bit longer to complete the game. Though, to be honest, I wouldn�t put the fault on the creator of the game as PPGs do have a tendency to have clunky controls in general as compared to the other creators. But for nine levels, it can take average players around five or six minutes to complete regardless of the controls, which is definitely too easy, providing almost no challenge to the player, just minor annoyances. Aside from that, the gameplay of Contrast wasn�t the best either. I�d say satisfactory at most since I did mention that it was simply a platformer made on the PPG. It was basic and straightforward; there weren�t any �revolutionary puzzles� or new things to be found in the game as one would usually expect from a PPG. However, I feel that opengangs was a lot more focused on building the story, design and ambience of the game to the point where the gameplay, difficulty factor and fun had been sort of lost. Perhaps if the creator had made this more story intensive, I would have been more impressed as Contrast clearly isn�t the type of game that wants the players to focus on the gameplay from what I had gathered. Actually, I�m not so sure on that, since the game kind of came off to me as confused, for a lack of a better adjective to describe that. -The concept that the creator tackled was very interesting and could definitely reel in a lot of curious minds to play the game. -Design was able to stand out despite the fact that many other games share the same or a very similar style. -The general ambience of the game matched well with the storyline; the mixture of the music and feel of the game felt quite nice and helped in letting the players understand what the creator was trying to convey to its players. -Frustrating, not very fun to play through. -Too easy once you�ve memorized the switch placements. -The design of the game was a double edged sword; it made the game look great, but at the same time it dragged down the general gameplay. While the review does come off to be quite negative given my ratings and my discussion above, I actually don�t think Contrast is a bad game. I think quite the opposite, actually. The game has so much potential to be better than what it is now given its concept and all; the execution was just not as good as I would have liked or expected. But like what I�ve said earlier, the story, ambience and design of the game were great, although the design was admittedly a double edged sword. The gameplay, difficulty, visibility of the objects and how fun Contrast was in general could use some improvement as I was actually quite close to leaving the game halfway through if it weren�t for how easy it was to actually beat the game. But overall, I feel like opengangs just needs to revamp this game just a little bit. Perhaps he could add a few puzzles here and there, and maybe deviate just even a tiny bit from the original style of the game so players can tell which is a useable object and which object is simply part of the scenery. If you were to ask me if this game is feature worthy, I�d answer you honestly with a no despite the fact that it is already featured. To be honest, while Contrast did succeed in some aspects, it also failed in others, creating an imbalance too large for me to be compelled to tell everyone to go and feature it and all. But it�s still a good game nonetheless, it just has its own set of pros and cons, like everything else.